Diane Currier, owner of Honeygirl Meadery, shares how a visit to Alaska motivated her to start her meadery and a how her award-winning mead is made. Listen to this interview to learn more about the Durham-based Honeygirl Meadery. This is Getting Dirty in Your Garden, brought to you by North Carolina State Extension Master Gardener Volunteers. I am your host, Harold Johnson, and I’m a Master Gardener in Durham County. Pollinators are important to agriculture. No one disagrees with that statement. How about a business where the very existence of the business is 100% dependent on pollinators? Please enjoy my enlightening conversation with Diane Currier, owner and the only fulltime employee of Honeygirl Meadery. 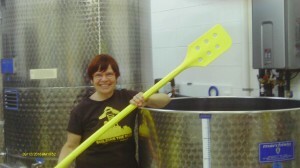 Diane, let’s begin talking about Honeygirl Meadery, the beginning. How did you get started? Well I started in mead making—the beginning of that was in 2004. I had been home brewing here in Durham since the late 90’s when I first moved here and went to visit my sister who lived in Homer, Alaska, which is a beautiful place. We were there at the height of summer and 24 hour sunlight and did a lot of hiking. One day my sister and I had hiked a whole field of fireweed—beautiful pink—it comes in after a fire and forest there, a natural process. In the afternoon she said, “Let’s drop by this meadery, it’s called ‘Ring of Fire Meadery.’” They are no longer open and went out with a real 20-year, great career. Anyway, I said, “What’s a meadery?” I didn’t know what it was at all. She said, “It’s amazing! They make wine from honey.” When I went in there, the first thing they said was, “Would you like to try our fireweed mead?” In trying that I thought I remembered being in the flowers; it just felt like the flowers were surrounding me because I had been hiking in them and now here I was drinking from those flowers. It was very powerful! I remembered that little meadery for years. So, 2004, I came back. I was regularly home brewing with a group of friends in my neighborhood and friends in general because it’s a great way to make friends, making alcohol and sharing alcohol. So I told them we are just going to make mead from now on. It was my hobby that I brought my friends into and it developed into more than that. One of the impetuses for that was that one of my home brews that I made for one of my own birthdays was put into the North Carolina State Fair and it took a ribbon, so for me that external validation was really powerful because it meant that more than just my drunk friends liked the mead and maybe it had a bigger audience out there of people who would appreciate it as well. So that kind of got me started on a journey to talk to anybody who had shiny stainless tanks in their place: brewers, cider makers, mead makers, wine makers—just a quest! To understand, it seemed very daunting, of course, to go from making 5-gallon batches to making 5-gallon batches, let’s say, so I wanted to know a lot about that. I traveled around Virginia, mostly locally here, up to Virginia to meet with the Black Snake Meadery folks, the Foggy Ridge Cider Maker and of course I met up with the Starlight folks down in Pittsboro—Ben and Becky Star. As soon as I met them, I asked if I could come in and help out in any way. Ben said, “Sure, come on in and bottle with us.” So that’s how I first met them. They were tremendously supportive of my desire to open a meadery and shared with me so much about their own business and business plan that really helped me writing my business plan. I am a planner, so I worked on that business plan for a while—it’s a big endeavor as you’ve seen some of the large tanks and the investment and the licensing. It’s quite a challenge up front that I felt I had to really rein that in and understand what I was getting into. But you’ve been saying that—I chuckle because you just really never know what you are getting into. Go back to when you said you first started and you met lots of people and friends. I’ve got to believe that you met a lot of beekeepers, and if you were trying to source some honey locally. A friend of mine keeps bees in Raleigh and mentioned that he got $12 a quart? That sounds about right when I think about local honey for sale at the Farmers’ Market and we have some awesome local beekeepers here who are selling honey. Dave Fruchtenicht is at the Durham Farmers’ Market with us, and a 50-year beekeeper here in our area. Yeah, I met so many and continue to and I absolutely love it because I am in awe of them. You know, that’s a really—mead making may be a really hard business, but beekeeping, so hard! So many losses, so hard to make that commercially viable, and people who are doing it on a smaller scale really inspire me because they are the ones, I think, who are right here in the neighborhoods from building it up, really, from neighborhood rather than a large commercial scale, which is also equally important—critical to the meadery—that there are commercial beekeepers, too. But I like seeing the local interest. As I calculate the number of gallons of honey you need for one batch, that’s an expensive burden that you got in that tank. Want to make sure it all works out well! Exactly, Harold, you really hit it on the head. For me it’s a very careful and respectful process. And I do think about that—all the bees that went into that—I mean it’s immense! We’re using about 3 pounds of honey per gallon. So it’s very humbling to put 1400, 1600 pounds of honey into a tank and turn it into this beautiful beverage that really goes back to honoring that original source. So, there’s a lot of motivation in it and yes, I do want it to turn out and I do have a lot of worry and stress around that. Diane, interesting that you are able to do the process from mixing honey and water, putting it in the tanks, I guess, adding the yeast to start the brewing process. Until you get to the bottling, it’s you. Right. Right. I think it’s funny because when I was just going to say, I’m very careful about how it’s made. It’s a very slow process. I’ve thought a lot about, “Could somebody else really help me perhaps speed this up?” And it doesn’t ever—it’s like, “Not really!” I’m just going to be slow and careful with it. So far it’s at a scale where with assistance from a big pump or another big thing or having to recreate how you move those poundage(s) of honey into the big tank. I notice that you had about an 8 feet stepladder so you can be on top of the tank to stir, or…? Exactly, some of the additions that I’m making such as the yeast are going to go into the top of the tank, and that I do climb the ladder to make that addition but not the honey. Those 60 pound buckets would be about 100 pounds by the time I got to the top of that ladder, so for that I dilute it down here on what I call “my level” with water and then pump it into the tank. Thank goodness, yes thanks for that tip Ben Star of Starlight Meadery! Length of time—does it depend upon the addition, whether it’s blackberry mead or does it take longer for one than another? In my experience, it does take longer or I like to give it longer, particularly for the meads that contain just honey—what are called traditional meads—that don’t have additional fruit, spices, herbs or flowers. And so for me, with those, if I give it added time, I get a really smooth quality to the honey. And to me, it takes time to tease out all those nectar sources and let them come out a little bit, so that time, I can’t really describe the exact process—there are little minute processes—still little things are dropping out of the tank and also opening up with that additional aging. With the fruit meads, they can take a little bit longer, I find. I think the addition, there are additional nutrients for the yeast coming in from the fruit, so they can finish up earlier and be where I want them to be and have the flavor profile that I’m looking for, in 3-4 months, which to me is my fastest. 3-4 months is the fastest you can turn out a batch of mead? Yes, in the way that their processed, just the way that I’m doing it. And some of the tie-ups or some of the length of time before release starts to be about the coordination of the tanks and the tasks. If I’ve got this tank that’s got to move into that tank, but there’s something there, so I’ve got to back it up, often to do these multiple tasks to free up a tank. You use the actual fruit or the spice or the flower. You don’t buy some commercially made smells-like, tastes-like? Correct! That’s correct! I really like—and this is a passion. I love working with the whole fruit. And it’s also a bit of a liability, because it adds a challenge and adds a certain layer, both on the good side—I love that it’s going to come out a little bit different each year and I’m working with the fruit, and I know the farmer, and it came from up the road. I can take a North Carolina ingredient and express it via this vehicle in a different way that we can drink it—literally drink the field! That’s a big motivation for me that ties all the way back to that first Homer, Alaska visit with the flowers and that experience, being surrounded by that. …so you’re a great tie-in for us if we talk about maintaining a healthy bee population and provide pollination gardens, provide something in the fall so that they can winter over healthy, not just some sugar water, but real live plants that are blooming in the fall. You’re all kinds of dependence on bees. There’s just not enough honey available locally, I’m sure. The big batches that you need, but you make sure the honey you use is “single source”; is that the right term? “True source honey” is the term that the Dutch Gold uses; they are out of Lancaster, Pennsylvania. A lot of breweries and meaderies—there’s a lot of beverages that people are drinking right now that are made with that honey. The beautiful part about Dutch Gold is that they are guaranteeing they can track all of that honey back to the hive. I get wildflower honey from them that’s coming from other countries: Argentina, Uruguay, Canada, as well as the U.S., but Dutch Gold is guaranteeing that to be “true source” honey, which is very critical. You don’t want something that’s available on the market and you don’t know where it came from and how it was handled? Exactly, I don’t want adulterated honey. I don’t want honeys that are made with corn syrup and flavorings. For the careful process and the respect that we are wanting to give to the bees, I really want to use—a must—real honey. I talk about mead a lot. People come into the meadery and I find out that I really enjoy that part. I get energy from people and I work alone, so it’s a really interesting balance. Because I really actually need both of those parts, but I am realizing talking about people about what I do that it helps me stay in tune with and in touch with my passion. It helps me remember the parts of it that I love. There are some really long days and it’s not always pretty and not everything works out great. Although the batches have gone really well, I’ve had to, I’ve had some problems, some growing pains, some re-fermentation in the bottles and things I’m still learning about, but now I have some awesome new processes in place to help me. I learned that the filtration system I was using—plate and frame—really only removes about 70% of the yeast, even though I was going down to about half a micron level that is much smaller than yeast, so I thought that I was, but there’s actually another process that I can intersect right before bottling that is even more absolute—a membrane filtration. And since I am a home brewer turned professional, I’m learning as I go. I am a very careful person and I did supplement what I know as kitchen cook, which is really my background, or where I am coming from in the mead-making process, with some classes. Going back to what you were saying about there’s a lot in the tank when I have the local fruit or the honey or even just the honey, there’s a lot in there and if something, you know, goes a little off, or a little awry or the yeast starts pressing a little something off. I need to know what that is and how to deal with it, and also how to properly just sanitize really throughout this commercial mead-making process. Two questions that occurred to me—where do you teach the chemistry course that it took for you to know to produce mead? Sure, I took the course through a program called Vesta, V-E-S-T-A, which is a national viticulture and enology educational program through network throughout the U.S. I actually took my course, Chemistry and Wine-making, with a fantastic professor. I took an online course there through the Vesta Program. And I also took some intro to wine making from Surrey Community College right here. Now the second question that I mention. Where’s the office for this sales force? [Laughter] I see that you’re, oh gosh, 15 different establishments and some of those have 5 or 6 different locations, so you should have some sales force. Well, I should just show you my hat rack, because I wear all those hats! Ha, ha, ha! I do the distribution. We are able to self-distribute. That’s a good thing. It means that I can go out there and meet people who are going to sell the mead, but yes, it does take time and when I’m delivering to all the Total Wine stores, let’s say, in the area, that’s a three hour loop for me. But I love being out there direct, one-on-one, but at some point, you’ve pointed to a growing pain for the company. I do need some help as the company grows, with sales distribution, tasting management, even with the mead making. Ultimately, it is something that I’m holding onto as, I think, is appropriate for a two-year old business. I’ve learned a lot about entrepreneurship. I’ve run my own pottery business, making my own and selling my own pottery, so a lot of this harkens back to that. I’ve worked in offices, so I’m very adept at the office-management of the business, which I also do. Get on my hat and run the payroll, get on my hat and make the delivery and market the company, so that is a part where we only have typically four meads on our tasting, and it will probably always be like that. I’m not going to take over the world with mead, but to be a regional treasure–getting the folks interested in mead and honey and beekeeping. So you have seasonal, of course, when blueberries are in. You’ll follow that line, couple of months, maybe, when you make the blueberry mead, [Uh huh]. Strawberry, etc. Exactly, exactly, we actually have a fruit backlog, because right after strawberry season come blueberries, and during blueberry season comes figs, so if you could see the freezer, now, you would see that it’s actually all of those—all of our fruit from this year is there right now. I think you freeze everything individually—it’s not just a clump of blueberries. It’s all spread out, so that takes a lot of space. Exactly, yes, and that’s where’s there’s a lot of love in the bottle. We like to say that the fruit has been hand-processed. I have help on the fruit processing. Getting the fruit out on the tray, yes. We rinse it; we sort it; we de-stem it. We line it up in little rows on another tray and put it in the freezer. We take it out of that, put it into a container. Then it will come out of that, go into a mesh bag. Eventually it will go into the tank. So every time someone takes a sip of one of your meads, they should feel sense, taste, a little of the love that’s gone into it. It isn’t just a big commercial operation. Not at all. And all the way back to what you said earlier about the fruit being pollinated by bees. All the way back to that single visit that a bee makes to the strawberry plant to me showing up to pick some strawberries, that is another crazy thing that I do is that I pick the strawberries for the strawberry mead because the farm that grows the ones that I love is a pick-your-own strawberry farm. And they are delightful. The owners know that I am coming to pick. They are very, very kind people. So, our strawberries are a small batch because I want to use the strawberries from that farm. No bruises, no dents, no insect culls? Not—very little, although I can take a little bit of what I call “scratch and dents” on the fruits, but nothing major because I need a little bit of rot or “off-ness” that will carry forward. You mention a tasting room. Do you give tours? [Sure.] Are there open hours for tasting? We do! We are open on Saturday afternoons from 1-6 p.m. every Saturday. You saw our little tiny tasting room up front. It gives folks a chance to come see where the mead it made. I’m here doing tours that afternoon. You can also find us at the Farmers’ Market here in Durham and over in Chapel Hill on Saturday mornings, but all of our face-to-face really in showing off the meadery happens on a Saturday because during the week, it’s all those other tasks that we were talking about, about the making, marketing and selling of it. It is easy to find your web-site. I notice that there aren’t many honey-grown meaderies that Google can find. That’s delightful! I’m glad to hear that! Easy to find more information about you, about hours–I want to go hear some of the sounds of mead-making! Fantastic! Let’s do that. Alright, I can say what we’re doing. Alright, what are we going to do now? Well, right now I’m going to check the gaskets on top of all my tanks. They have what’s called variable capacity lids. The lid’s held by a gasket that’s like an inner-tube. It needs to stay pressed—pumped up to a certain pressure so that the lid will stay in place and keep oxygen out of the mead. It’s a very important and very quick task that I do here every day. I just look at this gauge and see that it needs a little pumping up to get it right in the middle of the pressure zone that I want it to be in—that green zone—so I open up that screw a little bit [sounds of pressure] pump that up and screw that down tight and it will hold that air in. Thinking about my first encounter with mead was at the Chapel Hill Farmers’ Market and I didn’t know what it was going to be like because honey, mmm, I was delighted and surprised that it was not a sticky sweet drink at all. Don’t we have a tank we can taste from? So you just pull some out of this great big 500 gallon tank? Oh, yeah, let me see if the air will go off and then we can reconnect so you hear that…[whizzing sound]. This is just the hibiscus petals, fresh lemon thyme, honey-water and yeast. Cheers! Wow! What a nice subtle, subtle taste! This is early on, so this is one of ours that ends up being bone-dry. I really like where it’s going. It’s got that hibiscus little bit of tartness to it. It’s almost like—I can almost taste that color of bright pink of the hibiscus petals. And the honey is much more in the background. This was the one that got the meadery started—the Hibiscus Lemonthyme. This was that ribbon that I got for that home brew recipe. Uh huh! Now, you’ve also gotten ribbons since then? Yes, some of the commercial meads and I’m happy about this because again, this is a passion of mine. I’m learning to put the meads in some commercial competitions to get them evaluated at that level. I’m happy that both this Hibiscus Lemonthyme and the Blueberry medaled. And this year’s Finger Lakes International Wine Competition, and the North Carolina State Fair gave a medal to the lavender mead last year and that was our first commercial medal. It’s been a great visit with you, Diane and I can’t think of any better way to end this than one more sip! Thank you, Harold. It’s been my pleasure to talk to you today! Is there anything else to be said about maintaining a healthy bee population in our world? You have been listening to “Getting Dirty in Your Garden” brought to you by North Carolina State Extension Master Gardeners. You may find this and future episodes on our website: gettingdirtyinyourgarden.org. Until next time, why not go out and get dirty in your garden?